Over the last few months the pickup on my guitar has developed an unpleasant distortion. 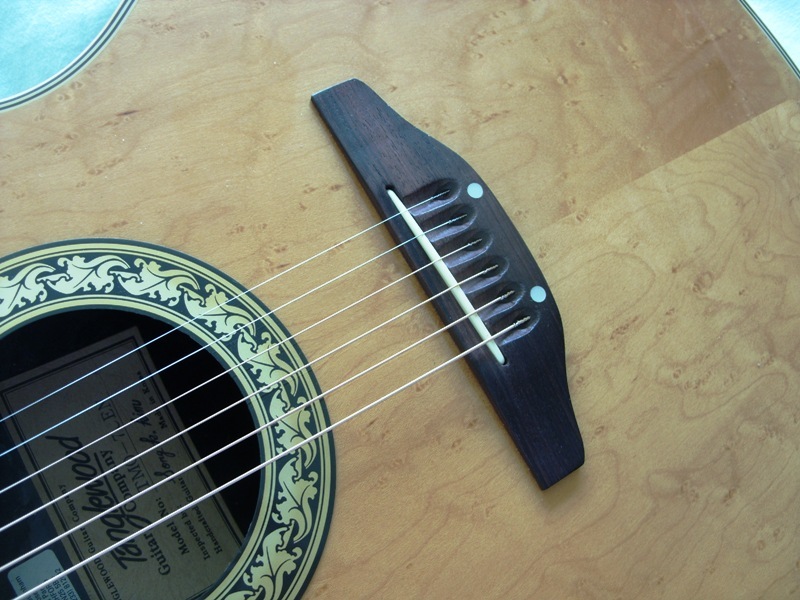 The A string produces a gritty buzzing sound. At first it was a very occasional, and intermittent problem. I thought I had cured it by putting a shim of paper between the saddle and the pickup under the A string, but the sound came back. The guitar is a Tanglewood Odyssey cut-away. It is a "bowlback" design with a fibreglass back - I bought the guitar back in 1992, so it has done good service, but replacing the whole guitar is an expensive proposition. So I started reading-up about under-saddle pickups on the internet. The name ARTEC kept coming up, and their pickups looked very similar to what was fitted to my guitar. I was particularly attracted to the SF-607 model because of this phrase " It reduces buzzing sound caused by curved bottom of saddle or rough surface of pickup cavity on the bridge of guitar. " 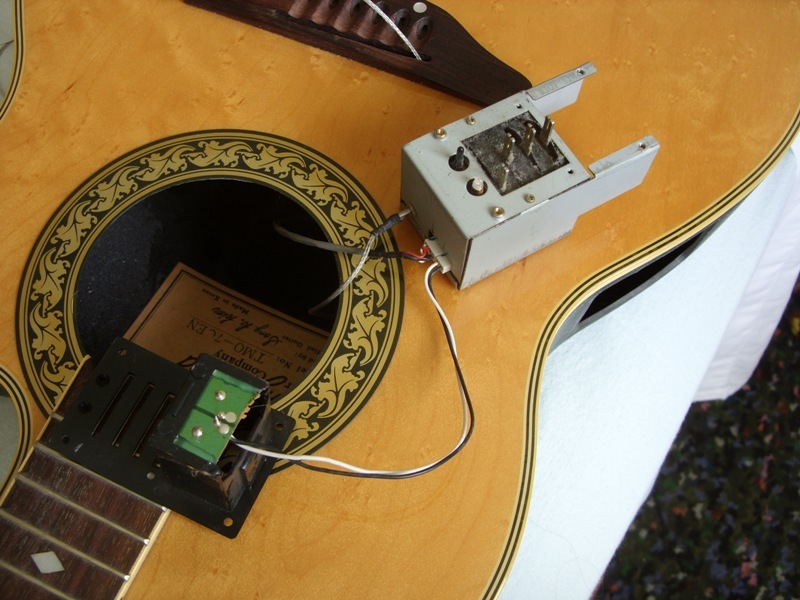 - I suspect this may be the "buzzing sound" that I have been hearing, or else the pickup has developed a fault. Unfortunately the Solidflex pickups are not at widely available on E-bay as the PP and PG versions, but I found one in Singapore for about £12 and made the purchase. 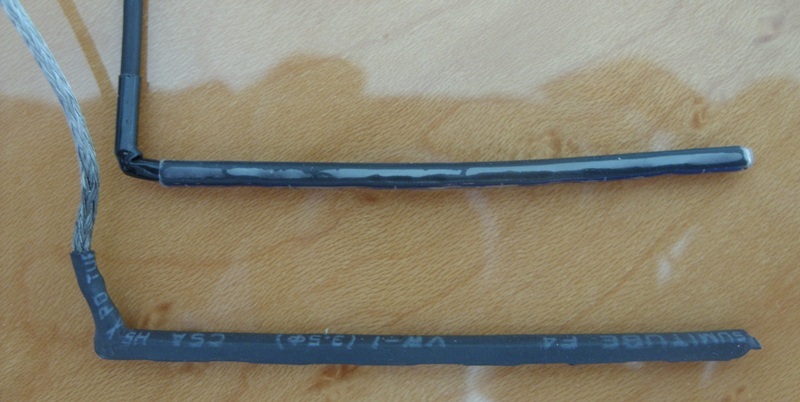 The pickup strip is blue and branded, the old one is covered with plain black heatshrink sleeve, but the width and thickness I measured to be within 0.1mm of the original. This was very useful because it meant it was almost a "drop-in" replacement. I say almost because the original was a snug fit in the slot, which required a little judicious filing with a needle file to accept the new pickup. I expect I could have forced the new one into the slot, but I wanted to be able to get it out again if I had to ! 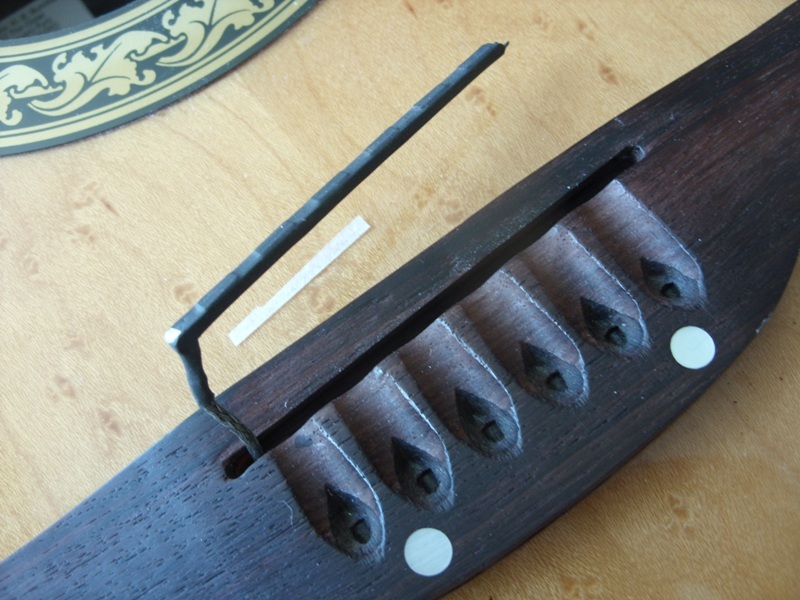 The pickup goes underneath the white saddle, which is a hard plastic, or bone material set in a slot in the wooden bridge of the guitar. 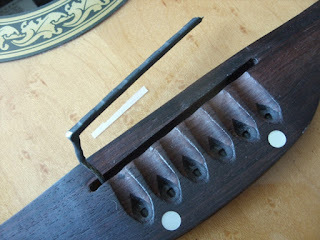 A hole is drilled at the bottom end to allow the screened cable of the pickup to pass through to the inside of the guitar. The hole is just big enough to allow the 2.5mm jack plug to pass through. This picture shows the old pickup lifted out of the slot, and the shim which I had added to try and fix the distortion problem. The new pickup just plugs into the preamp unit. 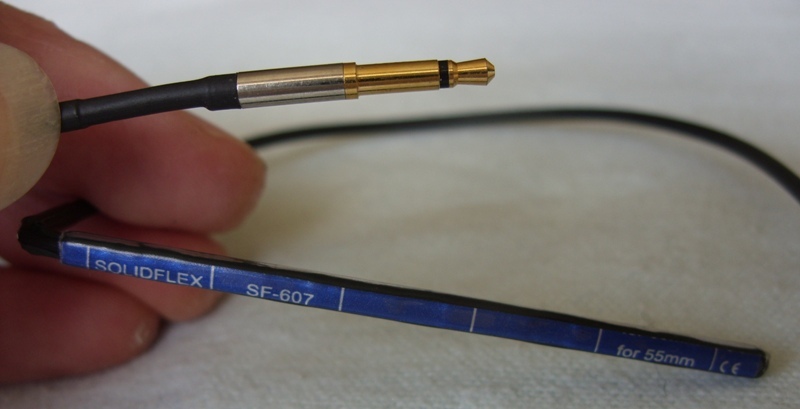 Remember to tidy and tape down the wires inside the guitar before putting on the new strings - otherwise they may flop about and rattle when you play it. I used "gaffer tape" (otherwise known as "duct" or "duck" tape). It is a useful opportunity to clear the dust out of the inside of the guitar - it had got decidedly mucky in there! Here's another picture of the EQ unit. - the battery holder and front panel is separate, and goes on the outside of the body, the screened metal box is on the inside of the body, and when the screws are tightened it all clamps up tight in the side of the guitar. I couldn't photograph that operation because I needed at least three hands to hold the EQ unit, front panel, guitar, screw and screwdriver - I didn't have any appendages left with which to operate the camera. Yes it does, but it is different to the old pickup. The output is lower and there is a bigger variation in output between the individual strings. The A and D strings are louder than the others. 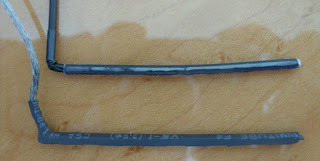 You can see the distortion on the "A" string, as the envelope looks "broken". The output is lower, overall, but the A string and D string are strongest. 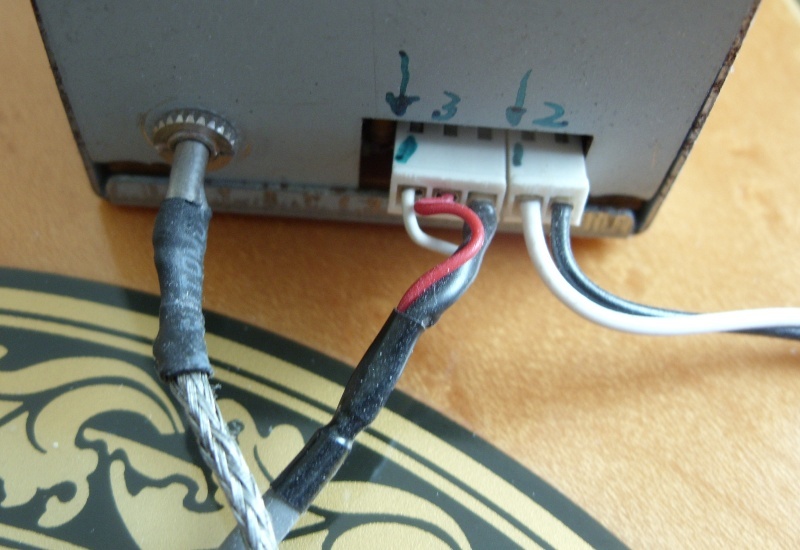 I estimate the top E to be about 6dB down, but the A string seems to be as strong as the old pickup. The good thing is that the output is clean and distortion-free. So I shall leave the new pickup in place for the time being and see how we get on with it. I will have to crank the volume up on the amplifier a bit to compensate for the lack of output.